"The world's premier international art show for Modern and contemporary works, Art Basel features nearly 300 leading galleries from North America, Latin America, Europe, Asia and Africa. More than 2,500 artists, ranging from the great masters of Modern art to the latest generation of emerging stars, are represented in the show's multiple sections. The exhibition includes the highest-quality paintings, sculptures, drawings, installations, photographs, video and editioned works. «La meilleure foire du monde» («The best fair in the world»), and the Frankfurter Allgemeine Zeitung observed «Die beste Kunst ist gerade gut genug» («The best art is barely good enough»). Located on the banks of the Rhine, at the border between Switzerland, France and Germany, Basel is easily navigated by foot and trams. On this website you can find practical information about visiting Art Basel, photos of past shows, press releases, and information concerning participating galleries and artists. To stay current on developments for the 2009 show, join our mailing list and you will receive updates as information becomes available. 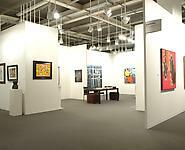 We look forward to welcoming you at Art 40 Basel."